sleeves that are used on those stands. 3/16 in. x 2 1/4 in., with edge of slot 1/4 in. from top of your card. PRICES SHOWN BELOW ARE FOR SHOW OFF MENU HOLDERS WITH ONE PIECE ACRYLIC BASE. ADD $3.75 PER UNIT FOR HOLDERS WITH HARDWOOD BASES. 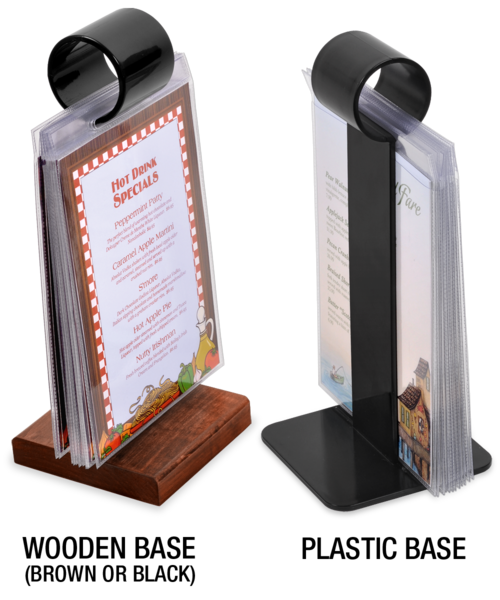 A menu holder that will help you to display your featured desserts, appetizers, beverages or anything else that will bring in $$$, right on your dining room table tops, bar or counter. 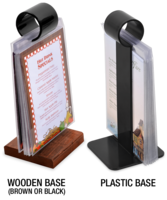 Show off menu holders are made of modified acrylic plastic that will cause the piece to bounce instead of shatter when it's knocked from your table or bar onto the floor. Our patented,one piece drum construction makes it super-easy to add and remove pockets. Use thumb and forefinger to open slit in drum. Drop in sleeves or cards. Release drum to close and hide slit. This demonstration video shows two pockets at a time being loaded onto the drum. Stands are 10.5 in. in height with a solid hardwood base and can hold up to twenty clear, plastic sleeves with no problem. Stands with Acrylic Base stand 9 in. high. Show Off Stands are available with either a solid hardwood base or as a one piece, all acrylic unit. Solid Hardwood Base is available in Black or Brown Oak and has a small 4 in. x 4 in. footprint and is 0.75 in. thick to give it enough heft to prevent accidental tipping. 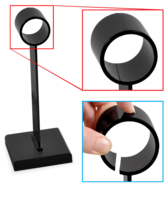 Stand is made of specially formulated acrylic and while we don't recommend it as a steady practice, our tests have shown that the stand will bounce and not chip or crack when dropped onto a concrete floor from table height. Use these NEW and LOW PRICED plastic stands with plastic or solid wood base to display multiple products when our wooden flip stands just don't fit your decor. Shop online with the Menu Shoppe today.